The state with its judiciary is the final arbiter of all conflicts , but there always exists traditional way of setting disputes at family or village level. India was and is a mosaic of languages, cultures and ethnicities, not simply tolerating each other but accepting and harmonising all the diversities as part of the composite whole. India is a modern state created upon an ancient civilization and secular one created on the basis of profoundly religious society. The real problem in many of our States and regions is economic; the conflict is over resources but camouflaged in various forms of identity politics based on religion, on caste, on region, on ethnicity, on language and less frequently based on ideological divides. Conflict has been defined as a situation between two or more parties who see their perspectives as incompatible. Conflicts have a negative beneficial connotation, but some conflicts are desirable as they can create change. Individuals see themselves as members of a variety of groups which often span a number of their interests. For example, an individual’s geographical origin, gender, caste, class,language, politics, ethnicity, profession and social commitments make him a member of various groups. Each of these collectivities, to all of which the individual belongs, tends to give him a particular identity,but together he has multiple identities. The search for identity is a powerful psychological driving force which has propelled human civilization.Identity is often evocative. It deals with a myth or an imagined community which has all the power and potential necessary for political mobilization. The sense of identity can contribute enormously to the strength and warmth of an individual’s relations with others such as his neighbors, members of his community, fellow citizens or people who profess the same religion. The concept of social capital, advocated by Robert Putnam, tells us how a shared identity with others in the same social community can make the lives of all those in that community so much more harmonious and meaningful. To that extent, the sense of belonging to the social community becomes a valuable resource;almost like capital. And yet, identity can also kill – and kill with abandon.A strong and exclusive sense of belonging to one group does, in many cases, lead to conflict. We live in an increasingly violent world, because of the conflicts we generate.The twentieth century was, by far, the most violent period that humanity lived through.Almost three times as many people were killed in conflicts in the twentieth century than in the previous four centuries combined together. The collateral damage of conflict is of both physical and mental. In the physical sense it leads to loss of life, infrastructure damage etc, but from psycological perspective it leads to erosion of faith in institution , public order , mutual trust . Building a road is easier than building the trust. The potential for conflict will always exist in a society with its members having different mores, interests, and socio-economic conditions and needs. Individual tension-An individual or a group have a sense that they are wronged.Poor Governance & Socioeconomic inequality are major reasons. 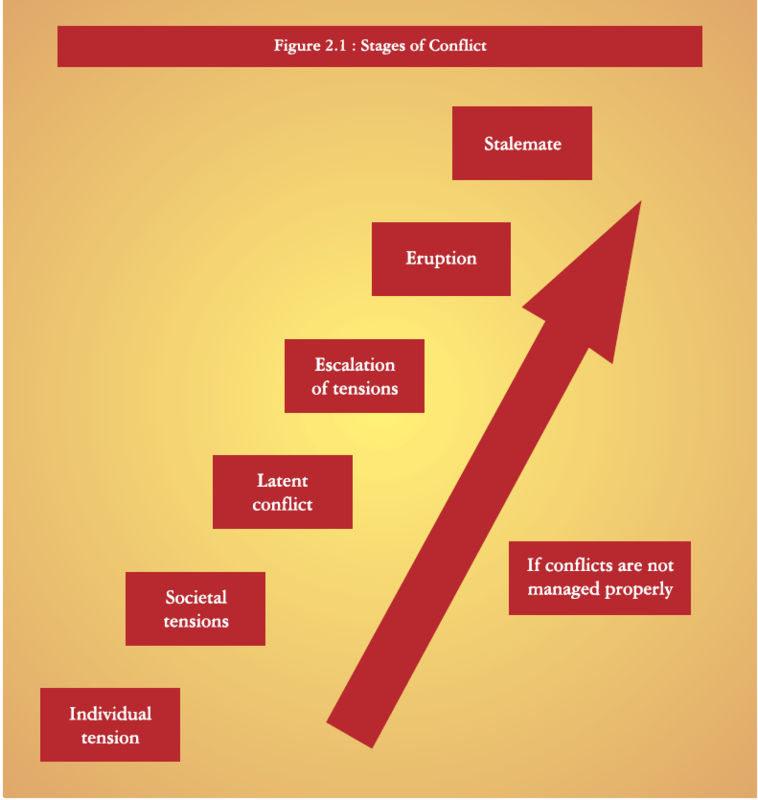 Latent Conflict – Tensions may lead to simmering discontent and may manifest as request /milder protest before authority. This is the most opportune stage for administration to intervene and stop the conflict. Escalation of Tension :-The manifestations are being processions,, strikes, bandhs etc.Unattended grievances, overlooked concerns, neglected tensions by the Administration leads to this stage. Eruption:- Tensions if not managed properly lead to a situation where a small ‘spark’ leads to eruption of violence. The ‘spark’ or the trigger may by itself not be a major event, but it leads to further polarization of the people involved, and becomes an excuse for the violent eruption.Usually this the stage where administration engages in ‘fire-fighting‘ strategies. Stalemate: This is a situation similar to the ‘latent tension’ and has the potential to erupt at regular intervals. Multi-ethnic , religious and identity based conflict with serious geographical and historical overtones include secessionist movement in N-E region, Kashmir and Punjab.The conflict resolution for these have different dimensions such as – peace instruments like – Assam accord, Autonomous territorial councils , extension of PESA and Forest rights act in N-E region to enforcing AFSPA in disturbed areas and deployment of military personnel in ares like Kashmir and Punjab where the issue is not only of national security and sovereignty but also of national strategic importance. Water conflict is yet to be resolved . Thought constitution has provided enough provision for water conflict resolution , the issues are far from over.The issues is intense in peninsular India (south India) as the river in this regions are mostly seasonal or carry a very low volume of water in the dry seasons.While north India fights against flood , south India fights against drought. Water management has been a great challenge for this vast county and the issue can be resolved only through comprehensive action by multiple civil society actors . water pollution only aggravates the woes . Ideological Conflict – Left wing extremism and their method to capture the state through revolution and exploiting the innocent of tribal to fight for their cause has been one of the major internal security threat that India has ever faced, however comprehensive approaches by govt has been able to contain the situation and deny them the ideological advantage. Communal Conflicts – Partition of India happened on communal lines and it is no wonder the issue still persists today with abrupt manifestations in isolated corners of society.Thanks to the visions of leader of India to establish a secular state , India is far more less communal the time of partition. More secular measures are need of the hour to eradicate this social bigotry. Regional Inequality – It is one of the major issue of conflict that India faces today. Bifurcation of Andhra Pradesh is its very recent manifestations.Economic deveopment and equitable distribution of fruits of growth can only contain this issue in a long term. States and its apparatus tended to view conflicts more in terms of break-down of law and order and less in terms of failure of socio-economic , governance and political processes.Thus resorting to fire fighting mechanism . State should pay adequate attention to genesis and try to contain the conflict before it appears . capacity building and enhancing effectiveness of institutions. Indian Constitution with democratic polity has the ability for conflict resolution in a diverse society as India. Their measures if implemented in letter and spirit can bring transformation in Indian society and conflict of serious nature will be a thing of the past.